With his version of Late Night, Jimmy Fallon continues to surprise us with consistently hilarious viral clips. 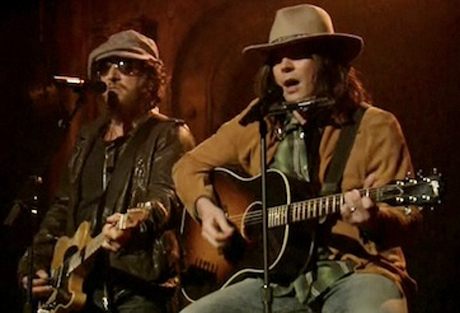 One idea that the SNL alum has continued to exploit is his pitch-perfect impression of Harvest-era Neil Young. Using this character, he's taken on Internet memes and the Fresh Prince theme song like they were nothing. On Tuesday (November 16), he upped the ante with an incredible song choice and guest spot. First, the song. For this clip, Fallon's Neil Young decided to cover "Whip My Hair," the world-dominating debut single from nine-year-old Roc Nation signee/celeb daughter Willow Smith. Hearing a faux-Neil Young cover this track is brilliant enough, but when the real-life Bruce Springsteen chimes in halfway through with an extra-rugged voice, its almost too much comedy for one sitting. Check out the clip below, as well as the Boss's performance of "Save My Love" with the Roots.